Social media outlets have a growing presence in today’s world. We’ve all seen the hipsters taking overly-filtered photos of their daily coffee for Instagram and watched in confusion as sorority girls at a baseball game take selfies for Snapchat. However, what you might forget to take into account are the business applications of the same products. Social networking is a critical component in making your mark on the web and improving your SEO. The people who just can’t seem to keep their hands off their phones happen to be the same people who are now looking for houses and, of course, mortgages. 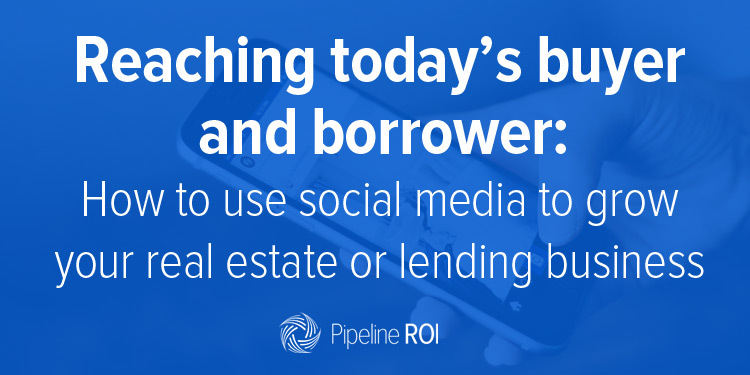 The generation of the millennial homebuyer is upon us, and if you want to remain top of mind, you have to meet them where they are: social media. If you’re not convinced, check out Social Media Today’s list of eight reasons why you should be active on various social networks. While this may seem like a no-brainer, it’s extremely easy to let your accounts fall by the wayside. Remember: fresh content helps keep your SEO ranking high. A key part of using social media is using social media. Be active. Whether you use photos of happy customers with keys in hand, a shared article about various goings-on in your town that weekend, or even a simple picture of you and your family on a recent vacation, make sure you’re staying involved. Millenials aren’t interested in faceless companies. They want to feel like they know you. Curious about how often you should be posting? Here’s a helpful infographic by Buffer and SumAll on frequency best practices. Millenials aren’t just the generation of social networking – they’re also the generation of blogging. Solidify yourself as an expert in your field by showcasing your knowledge. Share your blog articles on your various accounts to let your prospective clients know you’ve got the goods. Because Gen Y uses the Internet to do their research, they’ll begin to see you as the go-to source for all things real estate and mortgage. This will not only bring you visits to your website, but will ultimately result in leads. Naturally, I would be remiss if I didn’t mention SEO again here. The more sites that link back to your page, the better. And remember, you can’t link to your blog if there isn’t any content there. So get to writing so you can get to sharing! Word of mouth has moved to cyberspace. While nothing could ever fully replace in-person communication, technology has gotten us as close as we’ve ever been. Like I’ve said multiple times now, millenials do their due diligence on the web. So don’t fight it – use it to your advantage. At high points in your dealings with customers, ask for a review on one of your pages. You’ll want to have them on every site where you have a presence, so be specific. If you feel your Facebook is lacking in positive comments, ask that they post it there. If it’s your Zillow page, ask for it there. Make sure you spread the love so you can reach as many people as possible.